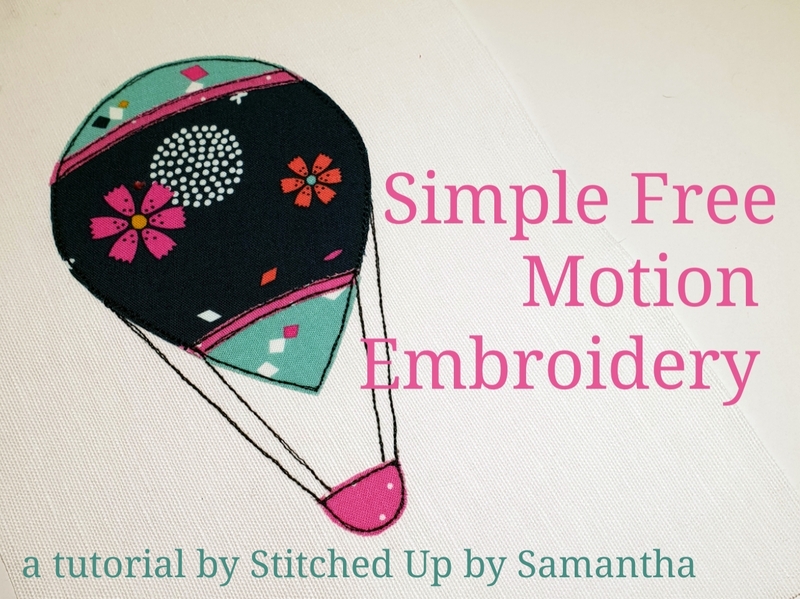 Today I'm going to show you how to create a simple free motion embroidered picture like the one above. Various coloured/patterned fabrics for applique. Mine are scraps of quilting cotton. Dark coloured thread and matching bobbin. A piece of medium weight iron on interfacing about the same size as your backing fabric. A Frixion pen or air erasable fabric pen. 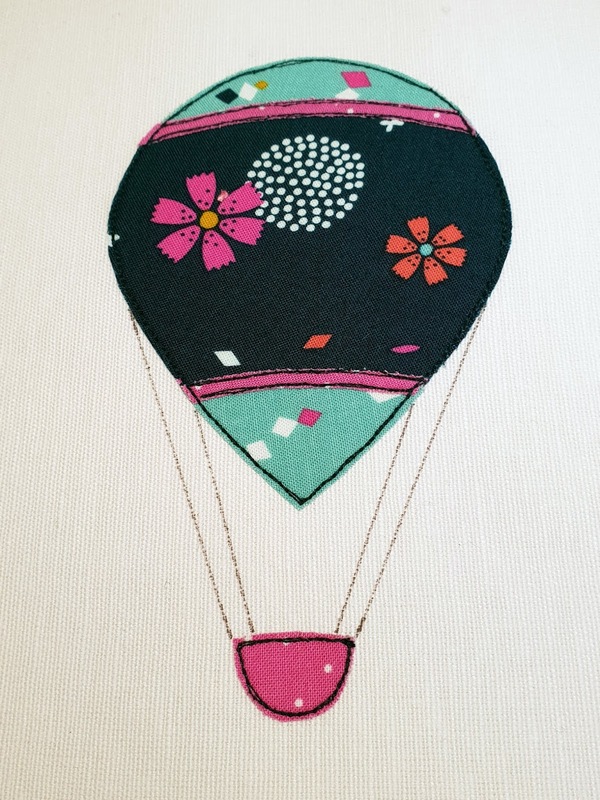 First prepare your backing fabric by giving it a good press and applying the iron on interfacing to the wrong side. Choose the image you want to recreate (or use as a basis, you don't have to copy it exactly), print or trace a copy and cut it into the parts you want to use. 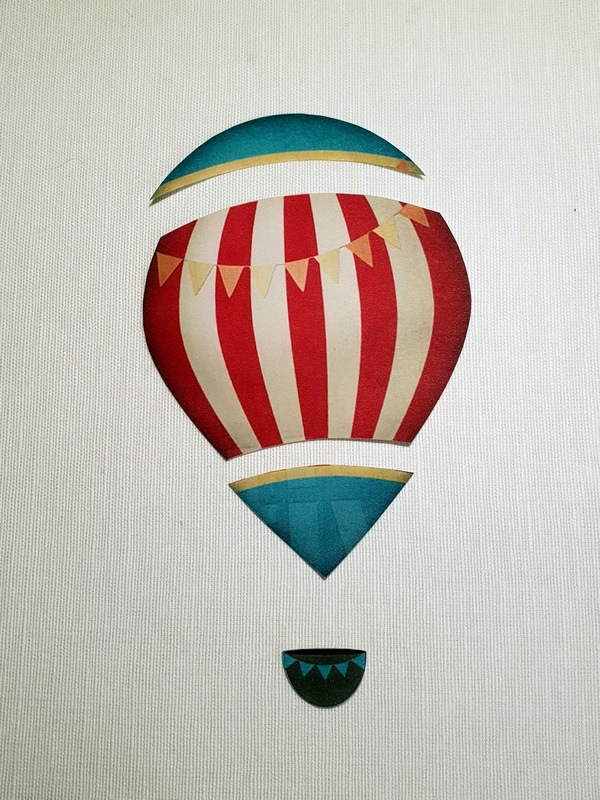 I have chosen to simplify this hot air balloon by cutting the centre striped section as one piece, but you could cut the stripes out separately if you chose. 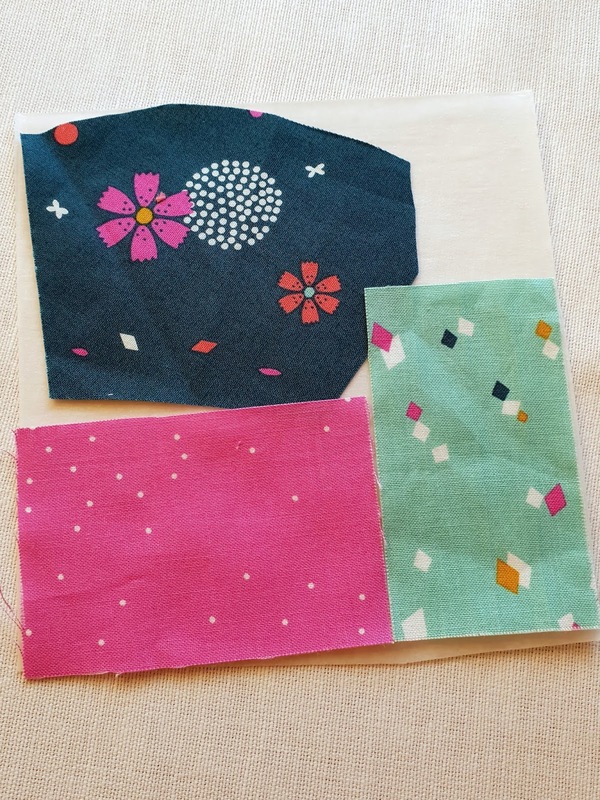 Choose your applique fabrics and cut a piece of each one slightly larger than you need. Take a piece of Bondaweb and lay it on your ironing board glue side up. Check the manufacturers instructions on how to use Bondaweb if you are new to it. 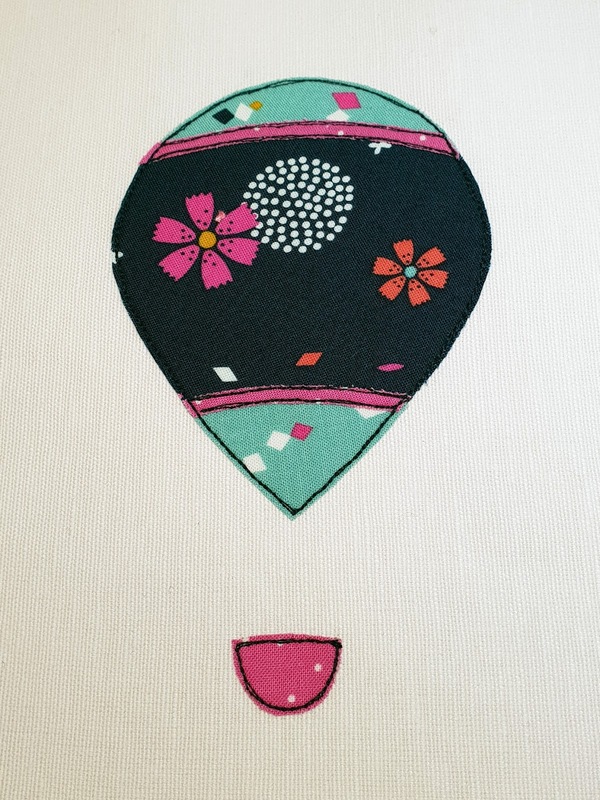 Place your applique fabrics right side up on top of the Bondaweb. This will ensure the glue adheres to the wrong side of the fabrics. 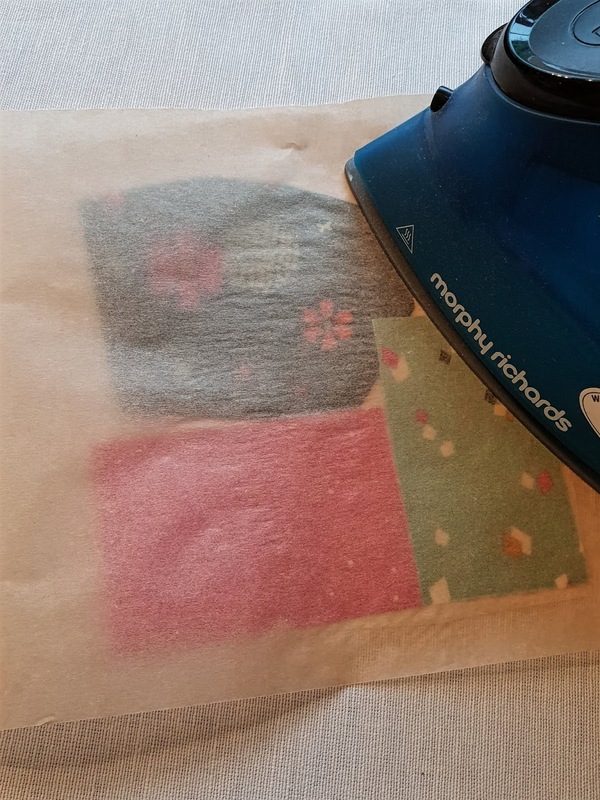 Cover with a piece of greaseproof paper to stop the exposed glue ending up on the baseplate of your iron and press firmly. It will take 10 - 15 seconds for the glue to activate. Keep the iron moving slowly and smoothly over the whole piece. Ironing onto the Bondaweb. Remember to cover with greaseproof paper! Remove the greaseproof paper and carefully peel the fabric from the Bondaweb backing. You should be able to feel the glue on the back of the fabric; it won't be sticky, but will feel slightly rubbery. 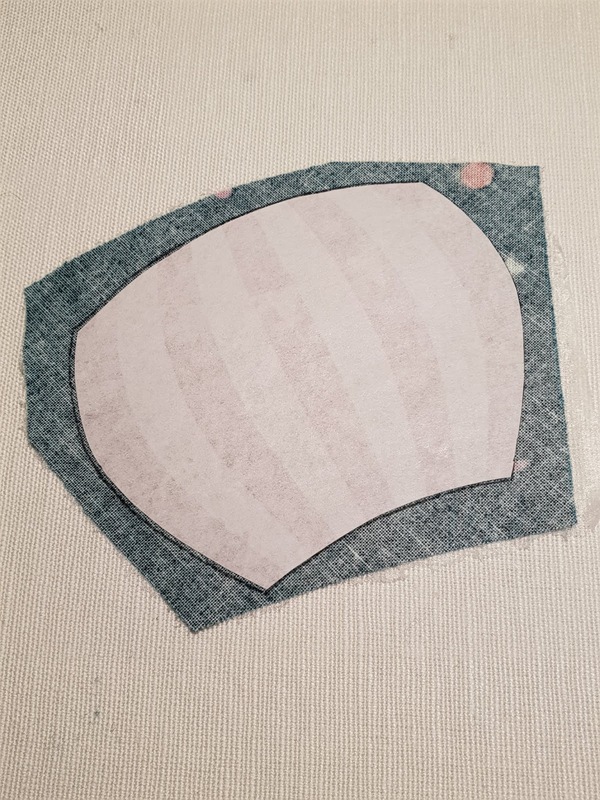 Place your fabric pieces right side down and with your template also right side down, draw round the template on the wrong side of your fabric. I use the wrong side to draw on so I don't end up with pen marks on the right side of the fabric. You can use any type of pen, I sometimes use a simple ballpoint pen, or a fine fibre tipped one. 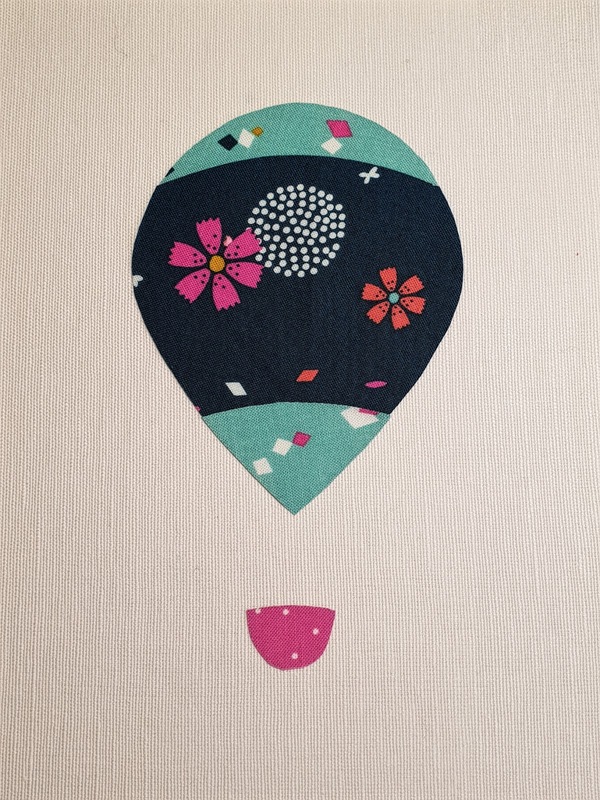 Cut your applique pieces out using some small sharp scissors and assemble them on the backing fabric. Once you are happy with their positioning, cover them with another piece of greaseproof paper and press again. The glue will activate again and stick the two layers of fabric together. Now it's time to start stitching. Using your sewing machine instruction booklet for guidance, drop the machine's feed dogs and put on your darning foot. 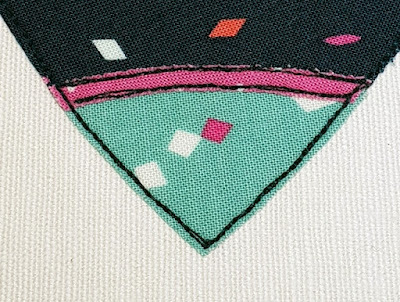 Set your machine to a regular straight stitch. You don't need to worry about stitch length, you will be controlling this yourself depending on how quickly you sew, and how quickly you move the fabric under the needle. When you start off you might think it's best to go really slowly but actually I find it's easier to go at a medium speed. This helps to give a nice, smooth flow to the lines you are stitching, too slow and your lines can end up jagged and rough. 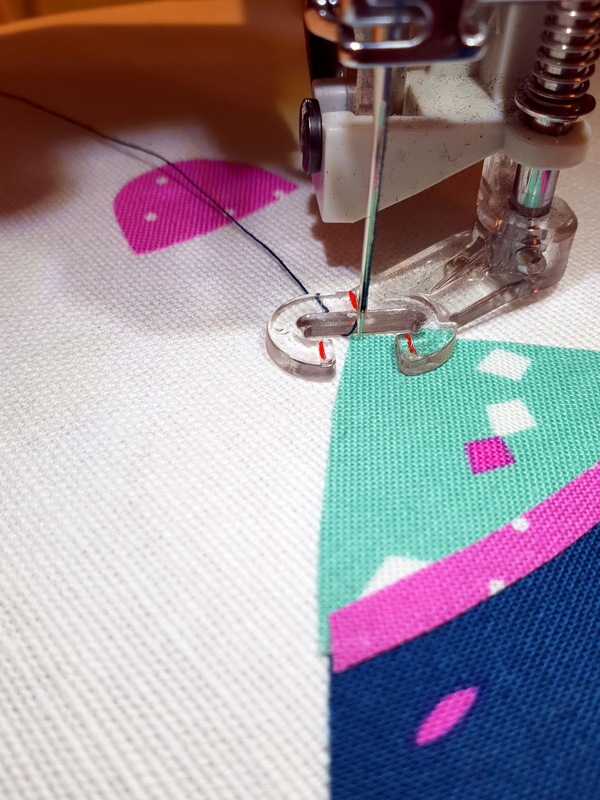 You can move the fabric as slowly or quickly as you like - quite independently of how quickly your needle is going up and down - and you can either turn the fabric as you go, or you can keep it facing one direction and stitch forwards, backwards and sideways. There's no right or wrong way; experiment to see what feels most comfortable for you. I always try to sew just inside the edges of my applique fabrics, and I normally go round each piece at least twice. This helps even out any "wobbles" on your first line of stitching. 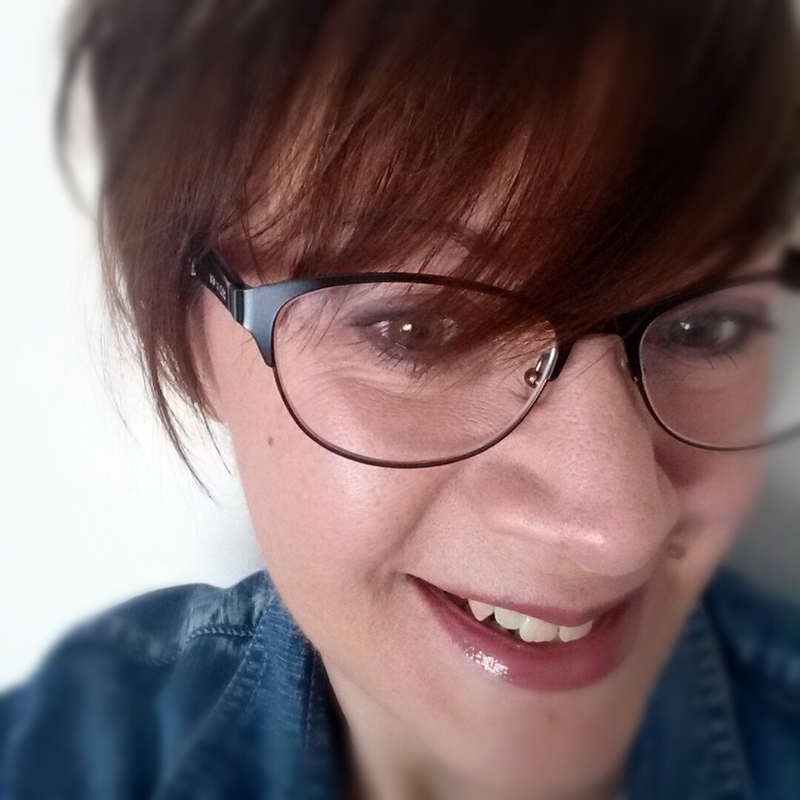 Start somewhere that looks easiest - I try to find a straightish edge to start on if I can. If your machine has the capacity to come to a stop with the needle down into the fabric instead of at it's highest point use this feature. The way the darning foot works means that the foot isn't in contact with the fabric the whole time, and the needle down in the fabric helps to stop it jumping to one side when you stop. 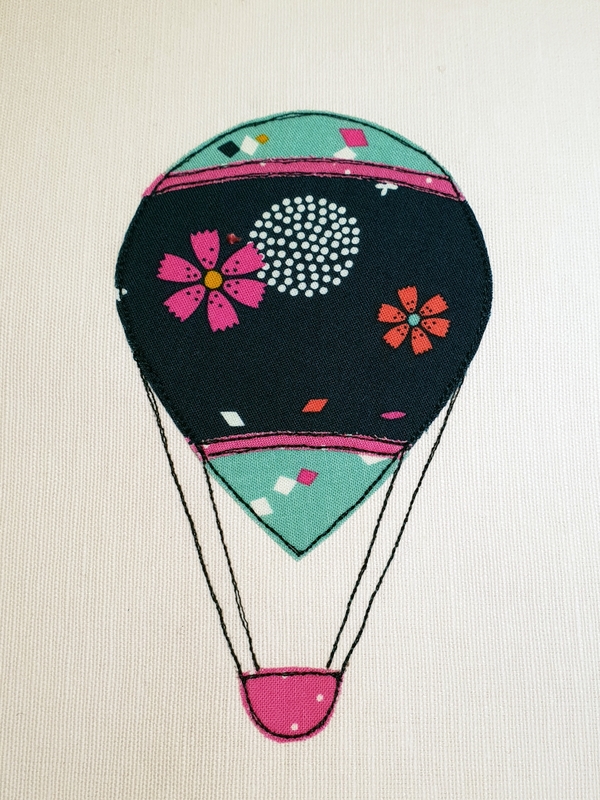 Once you have gone round each piece once you can use a Frixion pen to add extra details, like the ropes attaching the basket to the balloon. Frixion pen ink disappears when you press it with a hot iron, so they are ideal for this type of work. Once you have stitched the ropes, give your picture a quick press to remove any ink you haven't covered with stitching and your picture is finished! If you wanted to, you could continue to build your picture up by adding bunting to the balloon or ropes, or even to the basket. 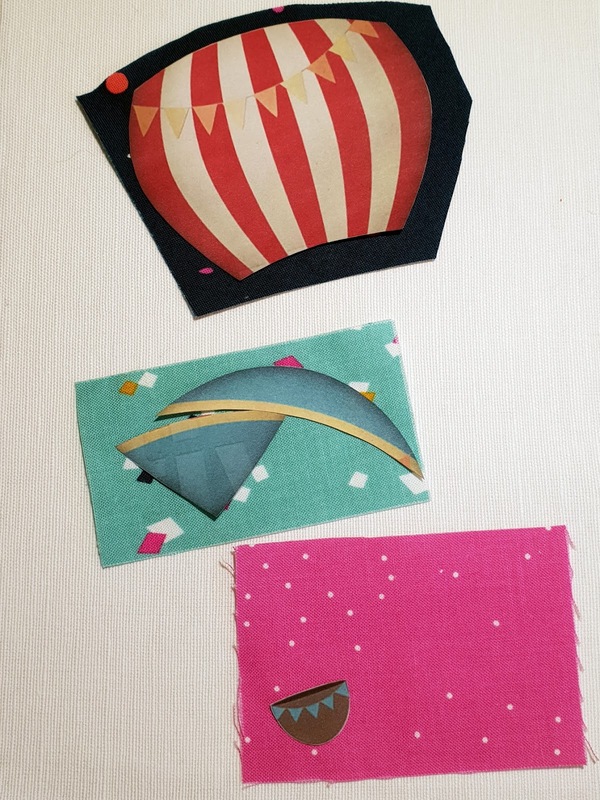 Try creating the same image using different fabrics and different coloured thread to see what a difference it can make. You could also try fussy cutting to include certain parts of a fabric design.